The Best Light Mover for the Grow Room or Grow Tent! A light mover is great if you're looking to increase light penetration without getting an additional light. There are many other benefits to having a grow light mover such as healthier plants or better spacing of branches. There are various models out there, and they are covered herein this review. What to look for when buying a light rail or circle rail and the benefits. We also go over the questions some growers have asked like do they increase the yield? How many pieces of the track? Tracks are great but if you have one that is just one length this might be an issue with the range of your grow space. Can you adjust the track? Some manufacturers allow you to manually change the track they also sell extra tracks as well increase your length. A time delay is essential to have even light on all sides of the growing space. Some types of grow room light movers have different types of speed on which they move. You can also adjust them as well, or they have only one rate. It's nice to have an option to where you can either hang it in the grow room or a grow tent. Some other things to consider. You can use a lower wattage depending on your space, but usually, 1000 watts is where you get your best Potential from your cannabis plants. Not a replacement for one light instead of two. Need proper lighting for the required area. There is various type of light movers out there some on rail or track, and some are a circular track. The track based movers come in various lengths and abilities like being able to hold multiple lights. Or to be able to change their track by adjusting the size using DIY. The circular light movers can hold up to four lights with reflectors. By moving in a circular, it keeps the light tight and focused in all areas. Here are the best grow light movers on the market today, most are made up of the rail technology. The Light rail 3.5 is perfect for a smaller size grow room or grow tent we need to move the light around. Great for getting rid of shadows if you noticed some plants aren't performing as well as others. This light mover has a 10 RPM motor and the speed cannot be adjusted. It moves at four feet per minute. You can also set a delay at the end of the cycle for up to 60 seconds. This is great to promote even canopy growth and to make sure all your plants are getting off the optimal amounts of light. Another great feature with the light rail 3.5 is that the tracks are interchangeable with the version Light Rail 4.0. A bonus if you want to upgrade. The distance of the track is 6 ft 6 in and come in two pieces, so it's perfect if you would like to DIY for a smaller space like a grow tent. You can get additional rails if you need to set a specific distance such as 10 ft instead of 12 or 6 feet. The Light Rail 4 can give you the Extra distance you need to reach the full length of your garden. What's cool about this light mover is that you can have two different speeds of the motor. The speeds differ from 6 RPM to 10 RPM, and that translates into time adjustments of 2 to 4 minutes per foot. Depending on the size of your garden this can drastically increase no production which then leads the buds and possibly a higher yield. The light rail 4 can use a Robo stick. 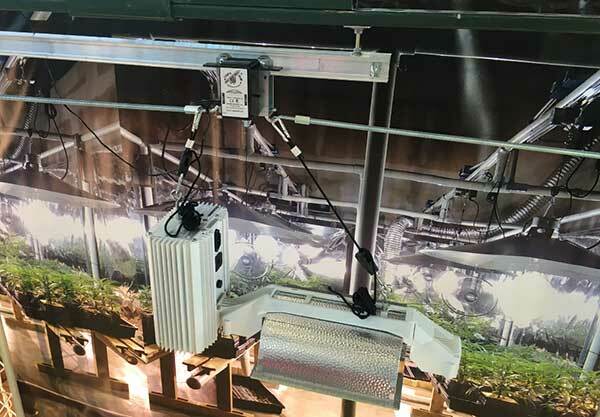 The Robo stick can be used for various LED grow lights or regular bulb lights depending on your setup and height availability. Another great feature with the light rail 4 if you have old or additional tracks from the models 3.0 + 3.5 they can be interchangeable. That's great if you want to DIY the light rail to fit your specific growing area. For either a grow tent or grow room even in greenhouses. The light rail kit 4.0 also comes with a delay feature for up to 60 seconds on each end of the light rail. This helps keep, and even canopy throughout the grow preventing the center part to have more growth than the end sections. This can also increase Bud sites and potentially increase your yield. The Light Rail 4.20 give you what everyone has been asking for the ability to have two lights on a single light rail. This is a great new add-on that they made from the 4.0 model. I suppose some growers out there asking light rail to make a light mover that can support two lights. But that's smaller than the commercial grower 5.0. The light rail 4.2 also has a two-speed motor from 6 to 10 RPMs and is also 8 ft 6 inches in length for the rail. It also comes with your standard 60-second delay which as you know will provide even light to the whole canopy of your garden. This light you can still do a DIY if you need to change the length of the rail. The bonus with this light mover is that you can use it with two grow lights instead of 1. This provides you more light spread to your area for possibly increased yields. - Can support up to 100 lbs. The Light Rail 5 is one Heavy Duty light mover. This Light rail is a beast made to a stand up to 100 lb of lights and reflectors. Uses a cross bar system, instead of having a perpendicular one, this enables you to use two to three lights at a time. More lights are excellent for a big spread over your grow area. If you need more rows for lights you can just add more on. One crossbar comes with the unit. Additional crossbars are extra. The light rail 5 is recommended for commercial grows but the home grower with big enough space can handle one of these. The additional across bar you can increase your lighting capacity threefold. The rail length that comes with the kit is 8 ft in length you can also buy additional rails as well if you need the length or two DIY you're set up. The motor speed is a fixed rate at 4 rpm, to provide the right flow when using multiple lights and prevents shaking and motor burn out. The Hydrofarm light track system is a basic light mover. With the Hydrofarm light mover, you can go to 6 feet distance on the rail. Unfortunately, you cannot DIY this rail, and they do not sell extra pieces as other manufacturers do. The speed is a constant 4.5 rpm, and you do not have the ability to set a delay at the end of the track this may impact even canopy growth. The Hydrofarm can support up to 50 lb which is enough for a light and reflector. The Tenwell adjustable light mover Is very versatile. You can DIY the rail to change the distance which is fantastic. The rail length can go up to 7 ft 2 in long. Additional rails cost extra but are available this is a nice bonus. Although this light mover can only support 22 lbs., it should be sufficient enough for small LED grow lights or the single light with a reflector. The Tenwell comes with a 10 RPM Motor most growers find this adequate speed when growing. The additional feature to this is that it has a delay from only two seconds to 2 minutes long. The Par-Tek light mover is a basic light mover. The light mover comes with a 10 RPm motor which is not adjustable. You have two rails included with a total length of seven feet 4 inches; this provides ample amount of distance for your lights. The Par-Tek also has a 0 second to 2-minute delay at the ends. Suitable for even canopy growth. 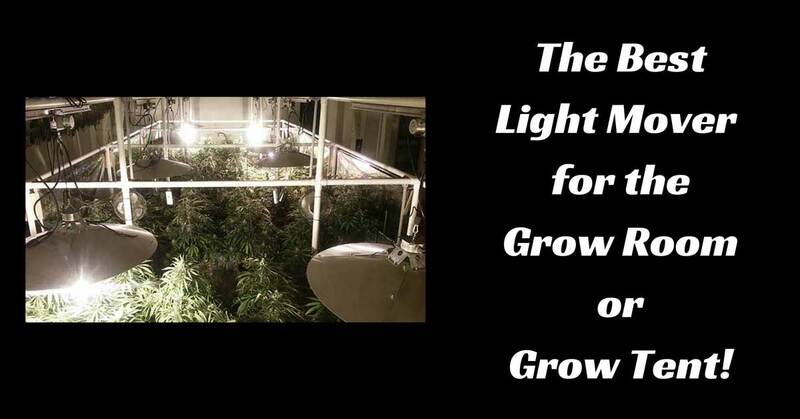 The Gro1 Light Mover is a general light mover that is more suited for the grow room. Not recommend for a grow tent it does not have the Crawford clips to handle a mover inside a grow tent. It comes with the 6-foot rail, and you can set the distance for how far you like the motor and your lights to go. The engine that comes with this is configured at 10 RPMs this mother cannot be adjusted. With this light mover from grow 1, you also can't set a delay, so it's just a constant motion back and forth. This can affect the growth of your plants possibly the middle sections. The Solar Revolution Light Mover provided light at different angles, sometimes called shadow shifting. This will help increase your lights efficiency. The solar revolution also reduces overall heat with the constant rotation. It has been said to improve yield up to 10- 15 percent. The solar revolution is a different style of light mover it can still cover a 4x4 to 8x8 area of growing space. Many growers out there want to know if light movers work, are they effective at growing good quality cannabis? The light mover allows you to give more light to your plants by placing the light closer to the top of the canopy than you can usually. By moving the light, it provides an even spread of light on the canopy. A light mover allows the light to penetrate the shadow areas of the plants normal blocked by the stationary position of the grow light. The light penetration also helps in getting light to the nodes that were frequently blocked by shadow or other leaf positions. Another question growers want to know is, are light movers worth it? Depending on the type of grow setup you have light movers can be worth it for healthy plants and potential to have a better yield with better efficiency of your lights. Do light rails increase yield? While others say no don’t bother you would be better off to get another light. Light movers may be beneficial for you depending on your grow and what's setup you have. When using grow light mover in veg, these are great for developing tight nodes spaces of the branches. It has been noted to increase yields depending on the lights you're using in space provided. When using light mover for grow tent, I recommend the Light Rail 4.0. This gives you the ability to have an adjustable speed of the motor and you can also DIY the light rail to size your tent. I also prefer the light rail 4.0 for the crew room as well when using a 1000 watt double ended gavita. Do you use a light rail? What are your thoughts on best light movers? The Best Microscope for Marijuana Under $15: A Focused Review! Kill Slugs and Snails on your Cannabis Plants! Very informative thanks! I’ve got a grow area of about 4m x 1.6m and I’m looking to run a light rail with 2 1000W DE Gavita HPS lights, will this give enough light cover for that length room?